The Power Elite's noose draws tight around Captain America, and he engages in some classic Steve Rogers soul searching before making momentous decisions. This issue's script makes interesting compromises. The basic plot developments and the way they're portrayed are very safe, which is to say, they border on simplistic. But they are executed with tremendous storytelling skill, and the ideas they're moulded around are deeply fascinating. This issue breathes fresh life and new perspective into the eternal questions at the heart of Captain America's character. Specifically: Where is the line between the man and the symbol? By what right does Steve Rogers hold the shield? When and how can he entrust his very personal mission to others? Formidable art does a great deal to ennoble a potentially-modest plot. What makes this issue a visual treat is the glorious way lines and colours work together. The scenes come together with exquisite blocking skill, and the small dose of action (courtesy of Bucky beating the snot out of the Bar With No Name) feels exciting. The colours layer in a remarkable amount of depth and make the characters and the world around them real. The line and colour combination gives most of the pages an excellent painterly feel. That being said, I'm not much of a fan of the specific colours arrayed on this palette. They lean too hard into "reality is gritty" territory, relying on endless variations of brown and grey and off-white. This steps a little past realism and into gratuitous grimness. The character work being done here is the big draw. Steve is back to grappling with existential Cap questions. The script does a tricky and easy-to-overlook job of layering the literal and metaphorical together, addressing them both without confusing them. This script strikes a superb balance between novelty and timelessness. Steve is basically doing another round of "why be Cap" self-doubt, but that classic light is refracted through the more specific prism of the ongoing plot. If I say that that plot and its development is the least appealing part of the package here, don't think I'm saying that the plot is actually bad. It's in slow but certain forward motion. Captain America #7 is, more than the average comic, one chapter in a larger story. It is a stage-setting and non-climactic chapter, and that can give the impression that it's uneventful. I have every confidence that this will slot into a fully-satisfying arc when the bigger story is complete. 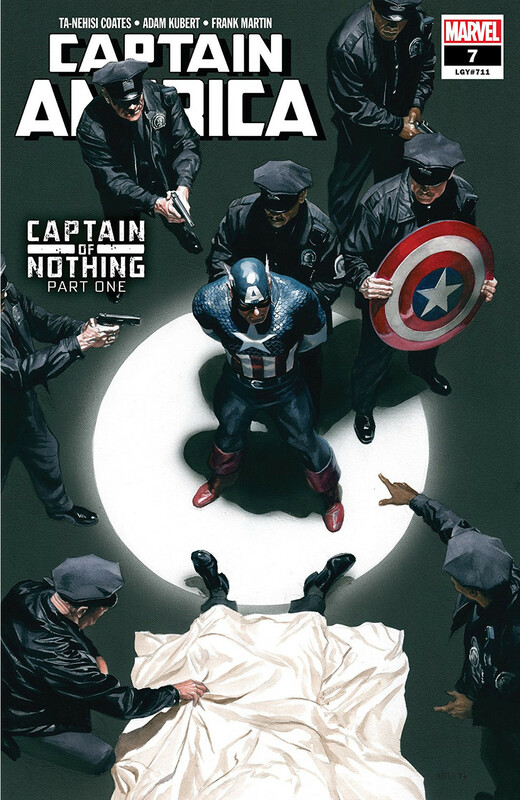 Captain America #7 takes a few small steps forward into an ominous plot. This issue concentrates on how and why Steve justifies his own steps, and the script does good work approaching classic Cap problems from novel angles. A rich artistic presentation adds considerable value and makes this feel like a promising start to a story worth following. The first and last scenes are awfully melodramatic; this quality sandwich is wrapped in some slightly stale bread.